The moment when the bride and groom cut the cake is truly a showstopper. 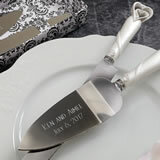 So why not add a sweet touch of cake cutting pizzazz to your reception with this interlocking hearts design cake knife/server set that also gives you a lasting keepsake to be passed on as a new family tradition. 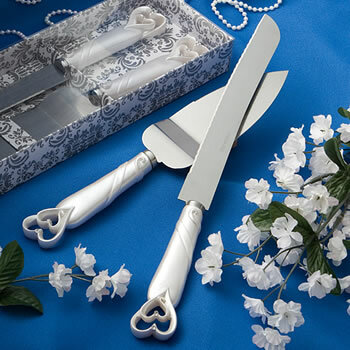 Perfect as accessories for a heart themed wedding or to add elegance to any wedding celebration, each interlocking hearts design 12 1/8" x 1" cake knife and 9 .75" x 2" server, from Fashioncraft's Finishing Touches Collection of wedding accessories has a white poly resin detailed/carved interlocking hearts design handle supporting a sturdy stainless steel blade/server. Each set comes delightfully packaged in a clear topped box with a slate gray and white damask design base for storage after your wedding day is through. Ordered this set for my wedding. It looks just as shown and comes in a nice decorative box. The quality is good and they're very pretty. I couldn't get over how fast I received the order. Great company. Extremely fast shipping. Very pleased with the product. Will definitely be using nice price favors again! Loved the set. Very nice quality. Very happy with purchase. Bought most of the matching merchandise. so much cheaper than stores or other online sites. Cake Knife set was just the right price and style for this affair! This cake knife & server set is beautiful and not expensive at all. I needed to buy a bunch as we are serving smaller cakes at each table at my daughter's wedding. I appreciated the quality and value.